Located at 699 North Broad Street, the Divine Lorraine Hotel stands out from its surroundings by both sheer size and architectural style, rendering it majestic despite its abandoned state in 2015. Built in 1894, the Divine Lorraine was designed by Willis G. Hale, an architect known for elaborate high Victorian designs. Standing ten stories tall, the Lorraine was an architectural marvel in its time. Prior to the Industrial Revolution, the limits of construction techniques restricted most buildings to three or four stories. The introduction of more supportive materials ushered in a world of possibility for building design. For the first fifty years after its completion, the Divine Lorraine was home to Philadelphia’s social elite. It first housed financial upstarts of the Industrial Revolution who, unwilling to associate with the pretentious old money of the Rittenhouse area, sought out a different neighborhood of Philadelphia. With their newfound wealth, they splurged on the Lorraine’s lavish suites, living in luxury with electricity, telephone service, and private staff. 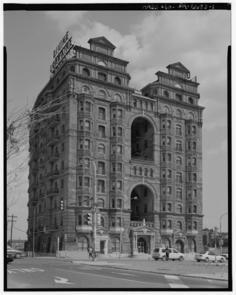 At the turn of the 1900s, the Lorraine adapted to the increasing commercialization of North Broad Street under ownership of the Metropolitan Hotel Company. The Lorraine rose to fame under the stewardship of religious zealot and outspoken civil rights activist Reverend Major Jealous Divine. He made it the first racially integrated hotel in Philadelphia, and one of the first integrated hotels in the United States. Reverend Divine- more commonly known as Father Divine- was the charismatic leader of the Peace Mission Movement and an alleged God incarnate. He inspired disciples in multiple cities in the Mid-Atlantic region through preaching his dream of a unified global society. He spent sixteen years establishing Peace Missions and amassing followers in the United States while based in New York City. 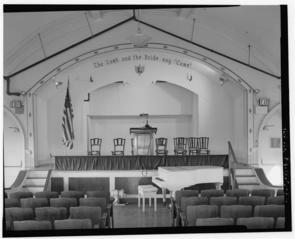 In 1942, he relocated his headquarters from Harlem to The Circle Mission Church in Philadelphia. Under Father Divine, the hotel was both a private residence and a community center. The Peace Mission prioritized community philanthropy; the Divine Lorraine was one of many establishments provided at low cost to the public. Guests of the hotel included post-graduate students, church groups, relatives of patients at the local hospitals, people seeking safe haven from traumatic circumstances, and dedicated members of the Peace Mission. 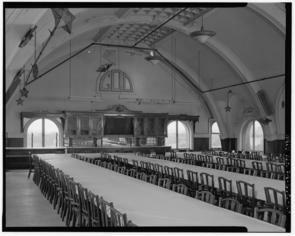 Father Divine transformed the 10th floor auditorium into a place of worship and the first floor kitchen into a public dining room where anyone could dine for just 25 cents per meal. Guests were required to adhere to the social tenets of the Movement: celibacy, pacifism, and honesty. Drugs, alcohol, gambling, and vulgarity were prohibited, as well as the receipt of gifts, bribes, credit, or insurance. Because of a near-absolute separation of the sexes, men and women lived on separate floors. The Divine Lorraine remained a residence to disciples of Father Divine and others seeking affordable housing in Philadelphia from 1948 until 1999. It was added to the National Register of Historic Places in 2002 to commemorate its place in civil rights history. The hotel’s glory days soon ended after the Peace Mission Movement sold it to an owner who stripped its interior and left it to decay. It remained derelict for nearly two decades before Eric Blumenfeld of EB Realty purchased and rebranded it as the darling of an urban redevelopment plan for North Broad Street. As of September 2015, the Lorraine is set to be reincarnated as luxury condos flanked by retail and dining establishments. Through racially and economically integrating the Lorraine, Father Divine made a building that historically housed the wealthy more accessible. Like the proverbial shepherd he claimed to be, he provided food and shelter for an underserved community. Under his ownership, the Divine Lorraine served the public for half a century; whether the hotel’s altruistic legacy will continue is yet to be seen. Foundation for Architecture (Philadelphia, Pa.), John Andrew Gallery, and Group for Environmental Education (Philadelphia, Pa). Philadelphia Architecture: A Guide to the City. 2nd ed. Philadelphia, Pa.: Foundation for Architecture, 1994. Hurdle, Jon. “A ‘Billboard of Blight in Philadelphia Acts as a Catalyst for a Revival.” New York Times, September 8, 2015. Accessed September 14 2015. http://www.nytimes.com/2015/09/09/realestate/commercial/philadelphia-hotel-beloved-but-abandoned-gets-new-life.html?_r=0. Mother Divine, and M.J. Divine. The Peace Mission Movement: Founded By M.J. Divine, Better Known As Father Divine. Philadelphia: Imperial Press, 1982. National Park Service. “National Register of Historic Places: African American History Month. “Lorraine Apartments: Philadelphia, Pennsylvania.” Last modified September 2015, accessed September 10, 2015, http://www.nps.gov/nr/feature/afam/2003/features.htm. Newall, Mike, and Michael T. Regan. “Left Behind.” Philadelphia City Paper, January 13-19 2005. Accessed September 10, 2015. http://citypaper.net/articles/2005-01-13/cover.shtml. Newlin, Heather. “The Divine Lorraine Hotel.” The Philly History Blog, March 26, 2007. 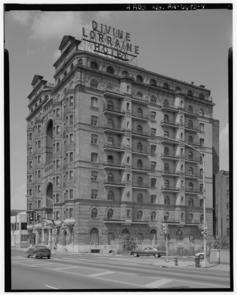 Accessed September 10, 2015. http://www.phillyhistory.org/blog/index.php/2007/03/the-divine-lorraine-hotel. Pennsylvania Historical & Museum Commission. “Pennsylvania Historical Marker Program: Father Divine.” Last modified September 2015, accessed September 10, 2015, http://www.portal.state.pa.us/portal/server.pt/community/pennsylvania_historical_marker_program/2539/search_for_historical_markers.